Two for me and three for you: five wee cottages all in a row. Probably. Sunlawshill Cottages are in the middle of fields and farmland a few miles from pretty Kelso, in the Scottish Borders. First time on the market, presumably because they used to belong to neighbouring Sunlawshill Farm (you'll want to check what else is up for sale or in the planning pipeline...), they're up for sale as two lots - numbers 3-5 Sunlawshill cottages, and numbers 1-2 have been remodelled as four-bedroom Smiddybank Cottage. 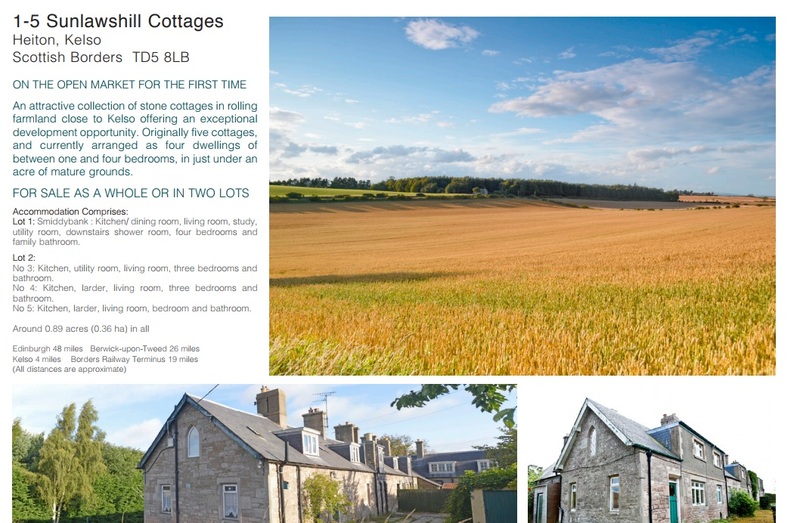 The Sunlawshill cottages have one, two or three bedrooms, and each has a living room, bath room and kitchen in various groupings. Keep them separate (I'm thinking holiday cottages for a family collective), or knock them into one (or two) houses, but please don't knock them down and start over with something glass-faced and modern. These are way too sweet not to be renovated and lived in! Lot 1 (cottages 3-5) is on the market at offers over £195k. More here. However, it then gets a bit complicated. According to the brochure, the properties are on the market in two lots, but I couldn't find anything online about Lot 2, other than that it sold two years ago. Whatever. The estate agent is Rettie; you'll want to call them. Incidentally, Rettie do seem to have form on the confusing two-part sale thing. The school and master's house below was sent to me by reader Katie. And, again, they seem to be to be offering it for sale as one big property, or selling the school on it's own for £195k. Doesn't make sense, particularly when there are no separate sale details on the master's house. So, there may or may not be this gorgeous, part-renovated four bedroom schoolmaster's house, with attached unrenovated school, in lovely coastal Burnmouth, for sale at offers over £255k. (Some) more here.